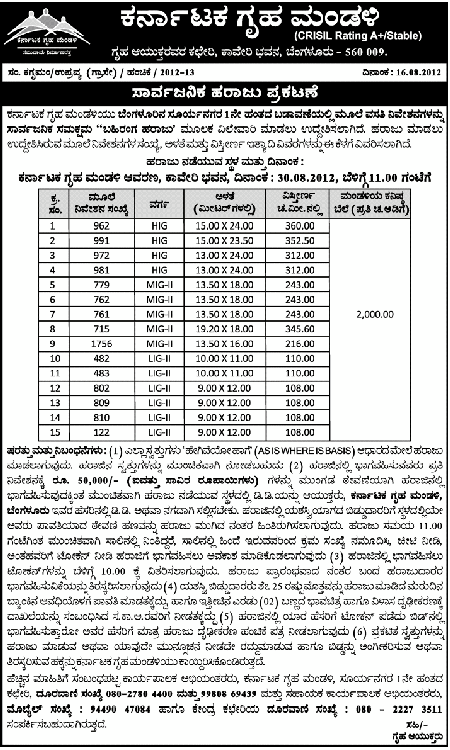 KHB recently put up an advertisement listing out sites for public auction in the 1st Phase. Basically all the sites are corner sites. This auction will happen at KHB office in Cauvery Bhavan on 30th of august, 2012 in the morning at 11:00. Rs.50000/- is the fee to participate in the auction and this has to be paid upfront as a deposit. This can be paid by preparing a DD in the name of Commissioner, Karnataka Housing Board, Bangalore or by cash. This should be accompanies with recent 2 passport size photos and address proof. Those whose names the tokens are provided on, would be the ones to whom the property would be registered and no one else. The KHB has the right to cancel this auction at anytime for any reason. Please note: this is NOT an e-auction, so you have to be physically present there. Good luck to everyone who is attempting and it would be much appreciated if you can provide the details of the winning bid amounts against the dimensions once the auction is over for the notice of other readers and their benefit!